Build and serve sundaes on the go with this brand-new version of Papa's Freezeria, with gameplay and controls reimagined for iPhone and iPod Touch! 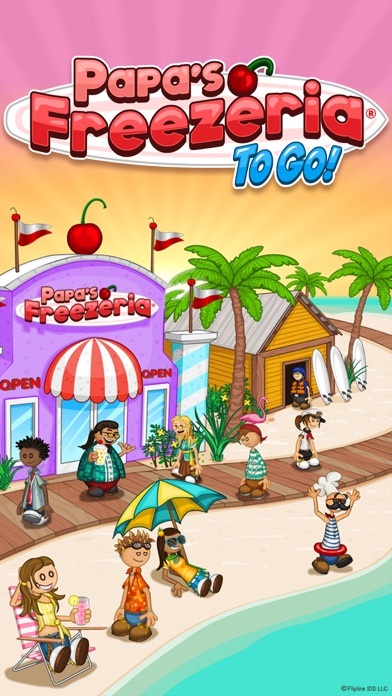 You've just started a relaxing summer job at an oceanfront ice cream shop, but things get hectic when all of Papa Louie's customers arrive on the island! You'll need to whip up delicious Freezer sundaes by pouring ice cream, adding mixables and syrups, blending sundaes, adding whipped cream and toppings, and don't forget the cherry on top for a perfect summertime treat! You'll need to multitask between each area of the restaurant, with new controls designed to work just right in the palm of your hand. Head to the Order Station to watch for customers waiting in the lobby. Switch to the Build Station to combine ice cream and mixables for each sundae. 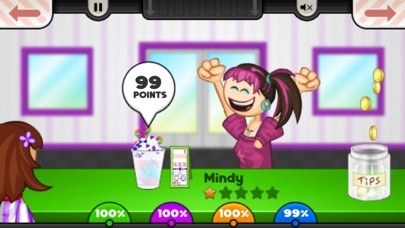 Jump to the Mix Station to mix sundaes until they're blended just right. Hop to the Top Station to pour whipped cream and toppings before serving the sundae to your picky customers. Each Station is a hands-on experience, where you'll need to drag, swipe, and tap your way through the sundae-building process. Keep your customers happy to earn points and level up. As your level rises, you'll unlock new toppings for the shop, and new customers will start to visit the Freezeria! 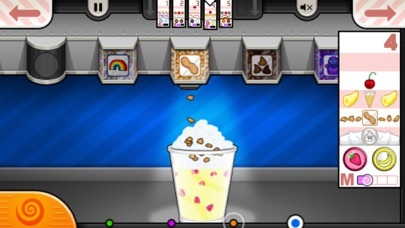 A well-crafted sundae also earns you tips, which you can spend on upgrades and decorations for the lobby! ** NEW FOR PAPA'S FREEZERIA TO GO** Papa's Freezeria To Go is redesigned and reimagined for smaller screens, so your fingers won't get in the way of the action! CONTROL WITH YOUR THUMBS - You'll switch stations using buttons in the corners of the screen, perfect for your thumbs. You can also use buttons in the top corners to quickly switch Order Tickets, and you can view all of your Order Tickets in a zoomed-in mode for easy reading. BUILD STATION - We've completely redesigned the Build Station for smaller screens. The Pour Button and Bonus Meter are moved to the side and sized just right for your thumb, so you can watch the meter and tap at the right time without any fingers blocking your view. When it's time to choose a mixable or a syrup, the entire screen is filled with large buttons so you can easily tap the correct item. MIX STATION - We've fine-tuned the Mix Station upgrades to work even better on small touch screens. Once you purchase the Blend Alarm upgrades, you can drag these large alarms and snap them onto any blender. Booster Buttons are also large and easy to press, and you can even use multi-touch to boost multiple blenders at once! TOP STATION - The Topping Bin carousel from "Papa's Burgeria To Go!" is back, which lets you top sundaes in a brand-new way! Swipe the carousel of Topping Bins to choose the item you want to use, then grab the sundae cup to start pouring toppings evenly across the sundae. You can also tap a button to switch to placeable items like cherries and cookies. And with full multi-touch support, you can keep one finger sliding the bins and another tapping on the cup below, so you'll have those sundaes finished in no time! NEW INGREDIENTS - We've added a ton of new ingredients that can't be found in the classic or HD versions of the game, including mixables, syrups, whipped cream flavors, and other toppings that you'll unlock as you play the game. There's over 70 unique ingredients for you to discover! 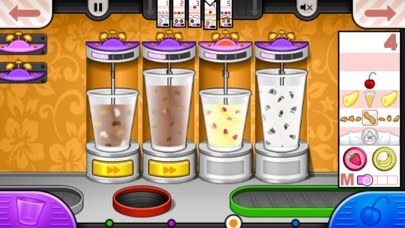 **GAME FEATURES** - Hands-on ice cream shop in the Papa Louie universe - All new controls and gameplay designed for smaller screens - Multi-task between building, mixing, and topping - Shop to buy upgrades using your in-game tips - 85 customers to unlock with unique orders - Challenging Closers and Food Critic - 120 in-game achievements to earn **NOTE FOR iPAD USERS** Papa's Freezeria To Go is designed especially for smaller screens. If you're looking for large-screen gameplay, check out "Papa's Freezeria HD" for iPad! I have no other words then DOWNLOAD IT! This games is AWESOME. I wish Papas Cupcakeria was 99€ too!!! The game is so much fun and I remember playing this game when I was in middle school. Not only Papa’s Freezeria, but also all of the other “Papa’s” games. The one downside i have found in this game is the graphics. They are absolutely atrocious and when I downloaded Papa’s Freezeria on my phone, I also downloaded Papa’s Pancakeria which has much better graphics but costs an extra dollar or two. I absolutely adore this game! It’s one of my favorites out of all the Papa’s games! However, it really stinks that this one isn’t like the others. While it is a bit cheaper, we should still be able to have Foodini’s mini games, create our own custom worker, and play through the holidays! I also miss the fact that we can’t place where we want the decor to go. Please please please update this game so we have all of these elements!!! This is a super fun game and it takes me back to my childhood, the only issue is I wish more items would be put in the shop, I have over 1,000 coins and I don’t have anything to buy. So this is really complicated but I’ll try to explain to the best of my abilities. I purchased this game and I love it; play it daily. I told my sister about it and she wanted to get it on her phone. For some reason, whatever it may be, it won’t let her leave a review, so I’m gonna leave one for her. In the middle of installing the app it got interrupted and took the money off her card but she doesn’t have the app. She really wants to play because this game is awesome, but if you could somehow help her fix this it would be very appreciated. Thank you ! !